Press Release: The Menagerie, also got onto Scoop online newspaper. A new variety show has come alive Wellington. The Menagerie is a collection of talented performers hand picked by veteran burlesque dancer Rachel Rouge. This variety show – started in November last year – is on every second month at the Fringe Bar on Allen Street. Each performer is given a time slot of up to 10 minutes, and has free reign to do anything they like with their slot. The next show on March 29th will feature Benjamin Crellin in the role of MC. Crellin, known as the dark knight of New Zealand comedy, has recently returned from the UK pro comedy circuit. 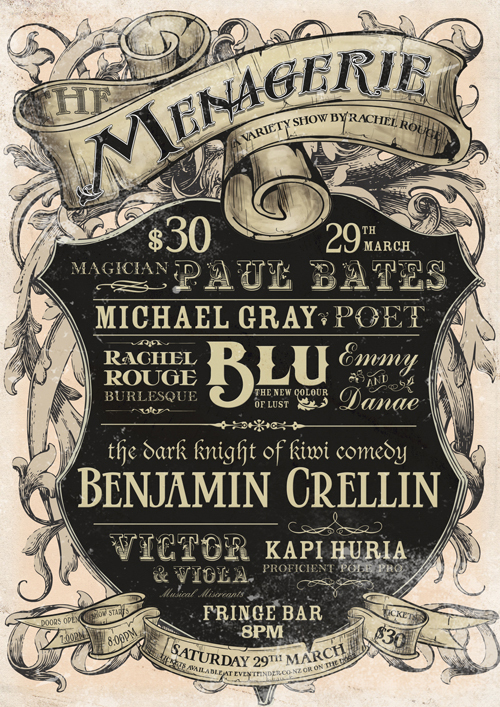 The March show also features established local magician Paul Bates, new hip hop dancing talent Blu, award winning poet Michael Gray, pole performance, singing, ukulele performance, and a burlesque performance by Rouge herself. The Menagerie aims to create a space where talented performers can try new things and stretch their boundaries. There may be acts to fall in love with, and acts that will be just plain weird. But if there is an act you are not enjoying there is comfort in the knowledge that within 10 minutes you will be watching something totally new and different. The next show is on Saturday March the 29th, and The Menagerie runs every second month at The Fringe Bar, 26 Allen Street.